Whether you are new to canning or an experienced canner, having the right canning equipment is crucial. As canning season approaches, we thought we would answer some frequently asked questions about what type of canning equipment that we use and find helpful in our own kitchen. For those wanting specific info on the products mentioned,we have included product links in highlighted red to help. If you are new to canning and if you will primarily be canning jellies, jams, salsas and pickles, a water bath canner is the way to go. 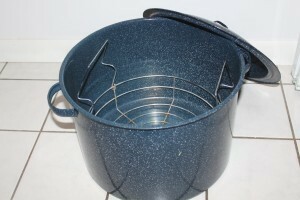 It is a large pot that can hold either pint or quart canning jars, and is used to process canned food using boiling water. It is fairly simple to use and is a good first step for those hesitant to try their hand at canning. Our well used Presto weighted pressure canner. If you are serious about canning food to feed your family, a pressure canner is a must! Although many people are intimidated and hesitant to use a pressure canner, they are actually easy and safe to use. There are two basic types of pressure canners: weighted gauge and dial gauge. 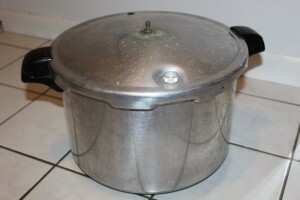 A weighted gauge pressure canner uses small weights to measure the pounds of pressure. Standard units are measured in 5lbs, 10lbs, and 15lbs of pressure. A dial gauge pressure canner measures the pressure through a regulated gauge. No weights are used. However, you should get your dial regulated every year to ensure that it is measuring the pressure accurately. We have used our Presto Pressure Canner for years, and love it! A wide mouth jar and ring. Not all jars are created equal! Some people prefer to use only Mason, Ball or Kerr Canning Jars, but regardless of the brand, there are a few important tips to consider before you buy your jars. Regular mouth vs. Wide mouth: This only has to do with the size of the opening at the top of the jar. Wide mouth jars are much easier to use when canning large items such as pickles and sliced fruits. 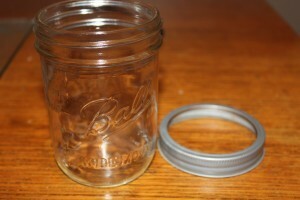 Regular mouth jars have a smaller opening and best used when canning sauces and liquids. Not all jars are interchangeable. – There are specific jars to be used at specific times. Some jars are freezer jars – that are not safe for canning in a hot water bath or pressure canner. There are other jars, especially those found at flea markets that are for decorative use only. And of course, there are jars that are designed to withstand the heat and pressure of the water bath or pressure canner. Before you purchase your jars, be sure to read the label to verify the approved use of the jars. Canning lids are what seals the jars and canning rings are what holds the lids secure prior to and during the canning process. The lids should never be reused. The rings can be taken off once your jars have been processed and are ready to be stored. They can be used over and over again as long as they remain in good condition. Make sure to buy the right size for your jars (regular vs. wide mouth) as they are not interchangeable. 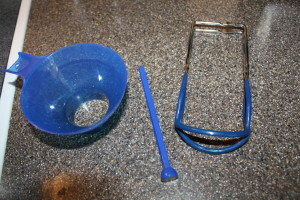 Funnel: Most kits include a funnel to help you fill your jars. It would be really difficult and messy to fill your jars without one. One thing to keep in mind – most funnels that are included in the kit fit on top of regular mouth jars perfectly. You will need to hold your funnel to completely fill your wide mouth jars to the top. Jar lifter: A must have tool to get those hot jars out of your canner. Magnetic lid lifter: This tool has saved me many times from burning my fingers as I lifted lids out of the hot water to seal the jars. Plastic tool: This tool not only helps you release air bubbles in your jars, but it also has a guide to measure the necessary headspace that it calls for in your recipe. Our food strainer in action. When it comes to canning equipment, this is a great one to have! If you are planning on making tomato juice, pasta sauce, salsa, apple butter or apple sauce, this tool is extremely handy and well worth the purchase! No need to peel your tomatoes or apples. After cooking them, run them through the mill. Not only will it separate out the skins, but it will also remove the seeds as well! It also comes with various sized strainers to allow for a thicker or thinner end product. 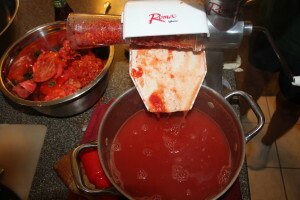 The brand that we use: Roma by Weston Food Strainer and Sauce Maker. This may seem like a trivial requirement for a list of essential tools required for canning. However, ask any experienced canner, and they will tell you that you can never have enough towels or washcloths when you are canning. From wiping the top of the jars clean before adding the lid, to wiping up spills as you fill the jars, to even having towels ready for the hot jars to sit on to cool, you will go through a whole laundry load of washcloths and towels before the day is done. Check out our favorite CANNING RECIPES. Ball has a new item that is worth the investment. It is an electric water bath canner. Simple, safe (temp controlled) and out of the kitchen. It works better than a hot plate because of the control, an you don’the have to lift a heavy pot off the stove/hot plate. You just lift the jars in the wire basket. Also, an old device called a Squeezo (real name) for tomato sauce, etc. which is all metal, no plastic, and simple to assemble/use. We bought ours on Ebay. It will last, and you can donate it to your grandchildren. Excellent advice on this subject as usual. I’d like to make a couple of suggestions about using your pressure cooker. I have my mother’s so that makes it about 90 years old. Still works like a clock, however, I normally invest in a new gasket every year, they are a nominal expense, and that way I know I will get a good seal with little problem. Also you can take your pressure gauge to your local home extension service for testing. It’s a good idea to do this periodically, just to make sure it is working correctly. With some of the newer pressure cookers a lot of this isn’t necessary, but it pays to treat the appliance with respect. Also, investing in a Victoro Strainer can replace your food mill. Much easier to use and a lot less time consuming. The seed and skins go one way, the pulp goes the other. Piece of cake. I don’t do much canning myself anymore, but i’ve been teaching my DILs, nieces and nephews, as well as some online beginners. I feel it’s a skill that needs to be handed down to the next generations.